by Chris Woodford. Last updated: December 16, 2018. Earth? It might be better called Oceanus: most of it is, after all, covered in water—much of it very warm water. The really interesting thing about the ocean is not how hot it is, but the difference in temperature between the surface (where the Sun keeps the sea relatively hot) and the depths (where the water, never warmed by the Sun, is considerably cooler). As any engineer knows, a temperature difference like this is very useful indeed if you're trying to make power. So why not use the heat in Earth's vast oceans to generate useful energy? That's the basic thinking behind OTEC (ocean thermal energy conversion), first suggested in 1881, which involves extracting useful energy from the heat locked in the oceans. How much energy are we talking about? According to some estimates, there's enough heat in the upper layers of the oceans to meet humankind's energy needs hundreds of times over. Sounds great! So... how exactly does it work? Let's take a closer look! 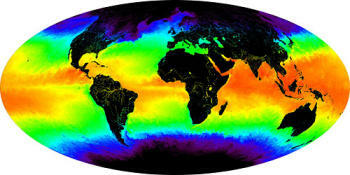 Photo: Temperature gradients: As you can see from this NASA map of ocean temperatures, there are huge variations in ocean temperature between warm tropical areas (red, orange, and yellow) and colder polar and temperate regions (green and blue). What you can't see from this map is the variations in temperature that exist at different depths of the ocean in the same region. The tropics (the area colored orange and yellow) have the best potential for generating OTEC power. Image by NASA MODIS Ocean Group, Goddard Space Flight Center, and the University of Miami courtesy of NASA Goddard Space Flight Center (NASA-GSFC). Most of the electricity we use comes from heat engines of one kind or another. A heat engine is a machine that cycles between two different temperatures, one hot and one cold, usually extracting heat energy from a fuel of some kind. In a steam engine or a steam turbine, for example, coal heats water to make hot, high-pressure steam, which is then allowed to expand and cool down to a lower temperature and pressure, pushing a piston and turning a wheel as it does so. The greater the temperature difference between the hot steam and the cooled water vapor it becomes, the more energy can be extracted (and the more efficient the engine). In OTEC, we use the temperature difference between the hot surface of the ocean and the cooler, deeper layers beneath to drive a heat engine in a broadly similar way—except that no fuel is burned: we don't need to create a difference in temperature by burning fuel because a temperature gradient exists in the oceans naturally! Since the temperature difference is all-important, we need the biggest vertical, temperature gradient we can possibly find (at least 20° and ideally more like 30–40°). In practice, that means a place where the surface waters are as hot as we can find and the deep waters (perhaps 500–1000m or 1000–3000ft beneath ) are as cold as possible. The best place to find such a combination is in the tropics (between the latitudes of about 20°N and 20°S). 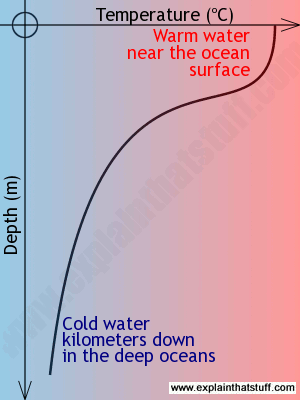 Chart: How ocean temperature various with depth. In the warmest, tropical parts of the world's oceans, surface temperatures are typically 20°C (68°F) or more. In the coldest depths, they're close to freezing (around 4°C or 39°F). This huge temperature difference makes OTEC possible. Water temperature changes rapidly with depth in the middle region, which is known as the thermocline. How much power could OTEC make? Considering how big and deep the oceans are, it comes as no surprise to find they soak up and retain vast amounts of solar energy. Some years ago ocean engineer Richard Seymour estimated that the oceans and atmosphere between them "intercept... about 80 trillion kW, or about one thousand times as much energy as used by man globally." How much of that could we recover from the sea? According to the US Department of Energy's National Renewable Energy Laboratory (DOE/NREL), on a typical day, the tropical oceans mop up heat energy equivalent to 250 billion barrels of oil. Converting a mere 0.005 percent of this into electricity would be enough to power the whole of the United States! However, impressive-sounding estimates like this don't take account of the tremendous practical difficulties involved in harvesting ocean energy. There are essentially two different kinds of OTEC plant, known as closed cycle and open cycle. In closed-cycle OTEC, there is a long, closed loop of pipeline filled with a fluid such as ammonia, which has a very low-boiling point (−33°C or 28°F). (Other fluids, including propane and various low-boiling refrigerant chemicals, have also been successfully used for transporting heat in OTEC plants.) The ammonia never leaves the pipe: it simply cycles around the loop again and again, picking up heat from the ocean, giving it up to the OTEC power plant, and returning as a cooled fluid to collect some more. How does it work? First, the pipe flows through a heat exchanger fixed in the hot surface waters of the ocean, which makes the ammonia boil and vaporize. The heated ammonia vapor expands and blows through a turbine, which extracts some of its energy, driving a generator to produce electricity. Once the ammonia has expanded, it passes through a second heat exchanger, where cool water pumped up from the ocean depths condenses it back to a liquid so it can be recycled. You can think of the ammonia working in a broadly similar way to the coolant in a refrigerator, which is also designed to pick up heat from one place (the chiller cabinet) and carry it elsewhere (the room outside) using a closed-loop cycle. In OTEC, the ammonia picks up heat from the hot, surface ocean waters (just as the coolant chemical picks up heat from the chiller compartment), carries it to a turbine where much of its energy is extracted, and is then condensed back to a liquid so it can run round the loop for more heat (just as the coolant in a refrigerator is compressed and cooled in the fins around the back of the machine). Ammonia (or another low-boiling, heat-transport fluid) flows around a closed loop at the heart of the system. That's the white square in the center of this illustration. Hot water enters a completely separate pipe near the surface of the ocean and is piped toward the central loop containing the ammonia. 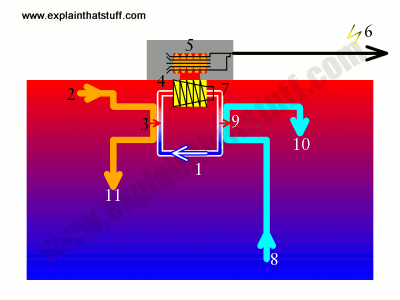 The hot water and the ammonia flow past one another in a heat exchanger, so the hot water gives up some of its energy to the ammonia, making it boil and vaporize. The vaporized ammonia flows through a turbine, making it spin. The turbine spins a generator, converting the energy to electricity. The electricity is carried ashore by a cable. Having left the turbine, the ammonia has given up much of its energy, but needs to be cooled fully for reuse. If the ammonia weren't cooled in this way, it wouldn't be able to pick up as much heat next time around. How is the ammonia cooled? In a third pipe, cold water is pumped up from the ocean depths. The cold water and ammonia meet in a second heat exchanger, which cools the ammonia back down to its original temperature ready to pass around the cycle again. The cold water from the ocean depths, now slightly warmed, escapes into the ocean (or it can be used for refrigeration or air conditioning). The hot water from the ocean surface, slightly cooled, drains back into the upper ocean. Photo: A model of a simple open-cycle OTEC system. The heart of it is a large turbine driven by steam, which is cooled by water pumped up from the deep ocean. Photo by Warren Gretz courtesy of US DOE/NREL. In open-cycle OTEC, the sea water is itself used to generate heat without any kind of intermediate fluid. At the surface of the ocean, hot sea water is turned to steam by reducing its pressure (remember that a liquid can be made to change state, into a gas, either by increasing its temperature or reducing its pressure). The steam drives a turbine and generates electricity (as in closed-cycle OTEC), before being condensed back to water using cold water piped up from the ocean depths. One of the very interesting byproducts of this method is that heating and condensing sea water removes its salt and other impurities, so the water that leaves the OTEC plant is pure and salt-free. That means open-cycle OTEC plants can double-up as desalination plants, purifying water either for drinking supplies or for irrigating crops. That's a very useful added benefit in hot, tropical countries that may be short of freshwater. Open- and closed-cycle OTEC can operate either on the shore (land-based) or out at sea (sometimes known as floating or grazing). Both have advantages and disadvantages, which we'll consider in a moment. Land-based OTEC plants are constructed on the shoreline with four large hot and cold pipelines dipping down into the sea: a hot water input, a hot water output, a cold-water input, and a cold-water output. Unfortunately, shoreline construction makes them more susceptible to problems like coastal erosion and damage from hurricanes and other storms. Photo: Coming in to land: Land-based OTEC means you have to pipe huge volumes of water ashore, which is what this giant cold-water pipeline does at the Natural Energy Laboratory at Keahole Point, Hawaii. Sea-based OTEC avoids this problem, but you have to carry the electricity generated offshore to land instead. Photo by Warren Gretz courtesy of US DOE/NREL. Sea-based OTEC plants are essentially the same but have to be constructed on some sort of tethered, floating platform, not unlike a floating oil platform, with the four pipes running down into the sea; early prototypes were run from converted oil tankers and barges. They also need a cable running back to land to send the electrical power they generate ashore. Hybrid forms of OTEC are also possible. So, for example, you could build an OTEC platform some distance offshore on the continental shelf, which would share some of the advantages of land-based OTEC (stability and durability, closeness to the shore, and so on) and floating OTEC (opportunity to exploit a greater temperature gradient, so generating power more efficiently). OTEC sounds immensely attractive: it's clean, green renewable energy that doesn't involve burning fossil fuels, producing large amounts of greenhouse gases, or releasing toxic air pollution. By helping to reduce our dependence on fuels such as petroleum, OTEC could also help to reduce the "collateral" damage the world suffers from an oil-dependent economy—including wars fought over oil and water pollution from tanker spills. It could also provide a very useful source of power for tropical island states that lack their own energy resources, effectively making them self-sufficient. As we've already considered, open-cycle OTEC can play a useful part in providing pure, usable water from ocean water. OTEC can also be used to produce fuels such as hydrogen; the electricity it generates can be used to power an electrolysis plant that would split seawater into hydrogen and oxygen, which could be bottled or piped ashore and then used to power such things as fuel cells in electric cars. The waste cooling water used by an OTEC plant can also be used for aquaculture (growing fish and other marine food such as algae under controlled conditions), refrigeration, and air conditioning. The biggest problem with OTEC is that it's relatively inefficient. The laws of physics (in this case, the Carnot cycle) say that any practical heat engine must operate at less than 100 percent efficiency; most operate well below—and OTEC plants, which use a relatively small temperature difference between their hot and cold fluids, have among the lowest efficiency of all: typically just a few percent. For that reason, OTEC plants have to work very hard (pump huge amounts of water) to produce even modest amounts of electricity, which brings two problems. First, it means a significant amount of the electricity generated (typically about a third) has to be used for operating the system (pumping the water in and out). Second, it implies that OTEC plants have to be constructed on a relatively large scale, which makes them expensive investments. Large-scale onshore OTEC plants could have a considerable environmental impact on shorelines, which are often home to fragile, already threatened ecosystems such as mangroves and coral reefs. Photo: Onshore OTEC plants can take up a lot of valuable coastal land. This is the Natural Energy Laboratory at Keahole Point, Hawaii. Photo by Warren Gretz courtesy of US DOE/NREL. Although OTEC plants are only suitable for tropical seas with relatively large temperature gradients, that's less of a problem than it sounds. According to DOE/NREL, OTEC could theoretically operate in 29 different sovereign territories (including warmer, southern parts of the United States) and 66 developing nations; and temperate parts of the world that can't operate OTEC most likely have alternative forms of ocean power they could exploit, including offshore wind turbines, tidal barrages, and wave power. Although OTEC produces no chemical pollution, it does involve a human intervention in the temperature balance of the sea, which could have localized environmental impacts that would need to be assessed. One important (and often overlooked) impact of OTEC is that pumping cold water from the deep ocean to the surfaces releases carbon dioxide, the greenhouse gas currently most responsible for global warming. The amount released is only a fraction (perhaps 10 percent) as much as that produced by a fossil-fueled power plant, however. How far off is OTEC? Scientists and engineers have been trying to extract useful heat energy from the oceans for over a century, with varying amounts of success. So far, only a few small-scale experimental units are operating. One is producing about 100kW of electricity (about 5-10 percent as much as a single wind turbine) in Japan, another is generating about half as much in Hawaii, and a third is now producing about 1MW in India; these are tiny amounts of energy that don't prove the long-term commercial viability of OTEC in a world where there are many other sources of power and the economics of energy have to be rewritten from one day to the next. All that could be about to change, however. After years of planning and construction, the Lockheed Martin company finally finished work on a 100kW prototype OTEC plant in Hawaii in August 2015. Depending on how successful that proves to be, bigger plants could follow; Lockheed has already announced plans for a 10MW offshore plant (with 100 times more generating capacity) in China. Under current economic conditions, OTEC plants are most likely to be constructed in or near small tropical islands that have little or no energy resources of their own, a high-dependence on expensive, imported oil, and perhaps a pressing shortage of freshwater as well; a combined OTEC power and desalination plant could be very attractive in that situation. Early customers are likely to include power-hungry US naval bases in tropical American territories—and that's one of the reasons why the US Navy is currently investing in the technology. All this sounds very exciting, but OTEC is still, essentially, a prototype technology that's harder to perfect in practice than to conceive in theory. In 2018, for example, amibitious plans to construct a 16MW offshore OTEC plant in Martinique were shelved indefinitely following major technical difficulties with the coldwater inlet pipe. Here's a brief timeline of some key moments in the history of ocean thermal energy. 1881: French physicist Jacques d'Arsonval suggests extracting heat energy from the oceans. 1926: Georges Claude, a student of d'Arsonval's, builds a prototype, on-shore energy-extracting machine on the coast of Cuba. In 1935, he tries and fails to construct an experimental off-shore OTEC plant on a cargo ship. With Paul Boucheret, Claude receives a US patent for an open-cycle OTEC system (number 2006985) on July 2, 1935. 1927: OTEC gains first widespread publicity when Albert G. Ingalls writes up the idea in an article "Inexhaustible Power from Sea Water—a Dream or a Prophecy?" in Scientific American (May 1927, pages 339–342). 1960s: American engineer J. Hilbert Anderson (a specialist in refrigeration and heat cycles) and his son James Anderson, Jr. begin studying ocean thermal energy. Having identified major shortcomings in Claude's OTEC plant, they propose using a closed loop of "working fluid" to remove heat from the upper ocean in a similar way to the mechanism of a refrigerator. They're granted US patent 3312054 for their "Sea Water Power Plant," based on closed-cycle OTEC using propane as the working fluid, on April 4, 1967. 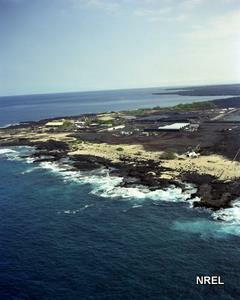 1974: The United States opens the Natural Energy Laboratory of Hawaii (NELHA) on 130 hectares (322 acres) of land at Keahole Point on the Kona coast as its primary test laboratory for OTEC. Using closed-cycle technology, it successfully builds a prototype, offshore, "mini-OTEC" plant on a US Navy barge. 1980: India begins a long series of research studies into OTEC, currently led by its National Institute of Ocean Technology (NIOT). 1982: Tokyo Electric Power Company and Toshiba successfully construct a small (100kW) OTEC plant on the island of Nauru, though much of the electricity is used to operate the plant and only 30-40kW is successfully fed into the power grid. 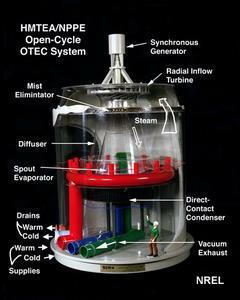 1993: The Natural Energy Laboratory sets a new record for open-cycle OTEC of 50kW. Six years later, it successfully tests a 120kW closed-cycle plant. 2008: Tamil Nadu Electricity Board is operating an experimental 1MW plant at Kulasekarapattinam, near Tiruchendur in the Tuticorin district. 2009: US Navy contracts Lockheed Martin to develop a 5–10MW OTEC plant (currently budgeted at $12.5million). 2015: Lockheed Martin opens its OTEC plant in Hawaii, connects it to the US power grid, and announces plans for a much more ambitious 10MW plant in China. 2018: The 16MW NEMO (New Energy for Martinique and Overseas) offshore OTEC project is abandoned following the discovery of major technical problems. OTEC: Ocean Thermal Energy Conversion: Introductory website from US DOE/NREL. This link takes you to the Wayback Machine because the original has, unfortunately, been deleted. The Indian 1 MW Floating OTEC Plant: An Overview by M. Ravindran, Director, National Institute of Ocean Technology, India. A good overview of India's efforts to develop OTEC. Sea Solar Power: A website promoting the OTEC technology developed in the 1960s by J. Hilbert Anderson and James H. Anderson, Jr.
Renewable Energy Resources by John Twidell and Tony Weir. Routledge, 2015. "Chapter 13: Ocean gradient energy and osmotic power" is a good introduction to OTEC. Fundamentals of Renewable Energy Processes by Aldo Vieira Da Rosa. Academic Press, 2013. Good introductory coverage for students and professionals working in renewable energy. Ocean Energy Recovery: The State of the Art by Richard J. Seymour (ed). American Society of Civil Engineers (ASCE Publications), 1992. A collection of papers exploring the main types of ocean energy, including OTEC, tidal, and wave power. Hawaii First to Harness Deep-Ocean Temperatures for Power by By Malavika Vyawahare, ClimateWire/Scientific American, August 27, 2015. 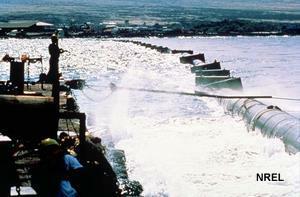 What are the prospects for OTEC now Lockheed Martin's Hawaii system is complete? Lockheed Ocean Thermal Energy: Back From the Deep by Rachel Courtland. IEEE Spectrum, August 29, 2014. From Hawaii to Martinique and China, a review of OTEC plants currently in development. Lockheed Martin Pioneers Ocean Energy in China by Eliza Strickland. IEEE Spectrum, July 25, 2013. How lessons learned from Hawaii could be put into practice on a large scale in China. More funds for Hawaii's Ocean Thermal Energy Conversion plant by Ben Coxworth. Gizmag, November 26, 2010. An easy-to-understand review of Lockheed Martin's Hawaii plant. Generating Energy From the Deep by Kate Galbraith. The New York Times, April 29, 2009. An earlier article about Lockheed Martin's project and the challenges it faces. Renewable Energy From the Deep Ocean: A basic 4-minute introduction from Offshore Infrastructure Associates, Inc, with good animations, based on Puerto Rico as an example location. Ocean Thermal Energy Conversion: Lockheed Martin: A longer, 14-minute introduction that includes details of Lockheed's OTEC plant in Hawaii and how it was tested. Nemo Project - Ocean Thermal Energy Conversion: A short (4-minute) animated introduction to the abandoned NEMO OTEC project in Martinique. Method and apparatus for obtaining power from sea water: US Patent #2006985 (July 2, 1935) by Georges Claude and Paul Boucherot. The original open-cycle OTEC patent. Sea Water Solar Plant: US Patent #3312054 (April 4, 1967) by James H Anderson and James H Anderson, Jr. The Andersons' original patent for closed-cycle OTEC.